IAF aircraft struck a group of terrorists who were placing explosives near the security fence in central Gaza. IAF aircraft struck a group of terrorists who were placing explosives near the security fence in central Gaza on Monday night, the IDF Spokesperson’s Unit said. According to the statement, the aircraft scored a direct hit at the terrorists. 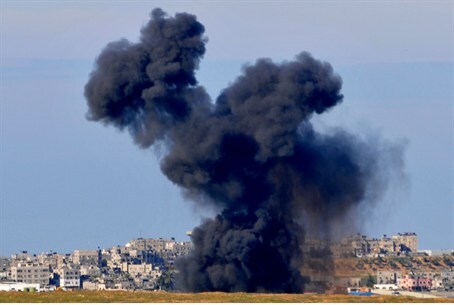 It was the IAF’s third strike of the day in Gaza, after a strike earlier Monday evening killed at least two terrorists in the northern Gaza town of Beit Hanoun. The targeted terrorists were engaged in launching a rocket attack at civilians in southern Israel at the time they were attacked, the IDF Spokesperson's Office said in a statement. An earlier attack targeting operatives riding a bicycle through the region eliminated two Islamic Jihad terrorists. The strikes followed a sniper attack by Gaza terrorists on Monday morning, in which a 36-year-old Haifa contractor and father of four was shot and killed as he worked on the security fence along the border. “The IDF will not tolerate any attempt to harm Israeli citizens and IDF soldiers and will continue to act against anyone who uses terror against Israel,” said the IDF statement, adding that “the terror group Hamas is directly responsible” for all terror-related incidents originating from Gaza. Earlier on Monday evening, a Qassam rocket launched at southern Israel from Gaza exploded in the town of Sderot. The rocket landed in an open area of the town, about 15 seconds after the Color Red incoming missile alert system was activated. No one was physically injured and no property damage was reported. An earlier attack targeted the Ashkelon coastal region.